$75.99 & FREE Shipping on orders over $59. The MoreBeer! 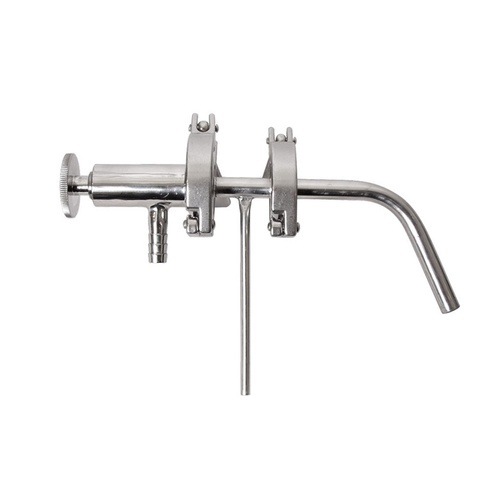 Racking Arm and Sample Valve has been designed to eliminate beer contact with threaded fittings. The path the beer takes in and out of the racking arm and valve is very smooth, reducing the places that dried beer and yeast can hide and contaminate your beer. It also has a positioning arm that lets you know at what angle the racking arm is inside the conical. This design replaces the ball valve-style arms from our old conicals. The assembly attaches to the 1.5 inch Tri-Clamp coupler welded to the outside of our MoreBeer! Conicals. The racking arm has a 1/2" inner diameter. 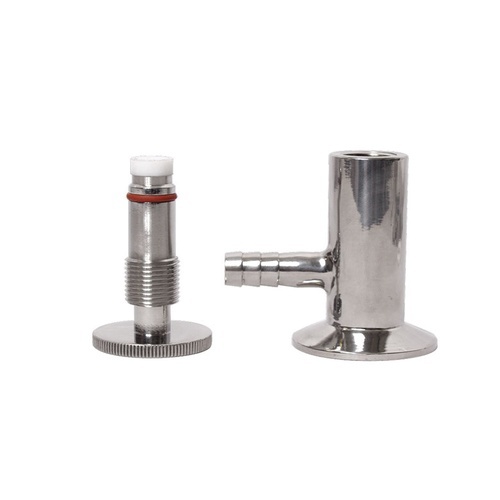 The Sample Valve seals at the front, and has a stopper and o-ring that separates the beer from the threaded fitting. As you unscrew the knob, you pull the stopper back and allow the beer to flow down the barb and into your sample glass or keg. Fits the size of the conical fermenter that I have. I bought this for a 2 bbl conical - it's really designed for a much smaller unit. However, it works well and the sample valve disassembles for easy cleaning. I just bought an SS BrewTech 14 gallon "chronical" - base model - not the BME. SS BrewTech has some great upgrade accessories, but their racking arm upgrade is just too big and unwieldy. It's a full on butterfly valve with a 3/8" tube on the inside. MoreBeer's threadless design is much more simple, elegant, compact, and lighter weight. They also include the HDPE gasket, which makes rotating so much easier. The racking arm made a great addition to this fine conical. NOTE: I did, however, have to trim a half inch off the end, in order to prevent the arm from contacting the sides of the fermenter. I used a (new) cutoff wheel on a 4.5" grinder to do the job. When I started brewing, I bought a basic no frills conical. I have been upgrading it as I can. I added tri clamp fittings first. This racking assembly came next and has been a great addition. I liked the fact that MoreBeer had this as a complete unit, not piece by piece. It is very well made and works perfectly. The service and price were good and you can't beat free shipping. I will be back. I bought this to use with the 7gal Chronical fermentor. I call ahead of time to get an idea of if it would work and the Morebeer employee I talked to went out to check and reported back that it would indeed fit. I've used it on one brew and it does work very well and I'm really happy with it. Great product and service! Good craftsmanship with very clean welds. The assembly is equal to the ones Morebeer uses in their conicals. All you've gotta have is a 1" or 1-1/2" tri-clamp port welded to the side of your fermenters cone. It was cheaper and easier than having all the parts sourced separately and hiring a pro welder to do the job. Morebeer had no problems sending it to my country (Brazil), so it deserves no less than 5 stars.